Art Machines: International Symposium on Computational Media Art is set to take place from January 4 -7 2019 at the School of Creative Media, City University of Hong Kong bringing together academics, artists and professionals in the field of computational media art in a four-day symposium whose core theme will be the topic of Machine Learning and Art. For this blog post, we thought this is such an interesting subject that we’d explore the area a little more. It’s certainly a fascinating area! Dawns, Mine, Crystal was an exhibition earlier this year featuring the work of Yunchul Kim, an electro-acoustic music composer and artist based in Berlin and Seoul. His exhibition at the Korean Cultural Centre UK (KCCUK) in London was his first UK solo exhibition and marked his nomination as ‘2018 Artist of the Year’ in the KCCUK’s major annual award programme. Working within the realms of contemporary art, science and visual effects, the exhibition comprised installations, drawings and sketchbooks and premiered Kim’s fluid kinetic installation – Cascade, a joint commission by the KCCUK, the Foundation for Art and Creative Technology, Liverpool (FACT) and Arts at CERN (the arts programme of the European Organization for Nuclear Research, Geneva). The work focused on the research of new materiality and the artistic potential of fluid dynamics and metamaterials (synthetic materials that exhibit properties not commonly found in natural materials). 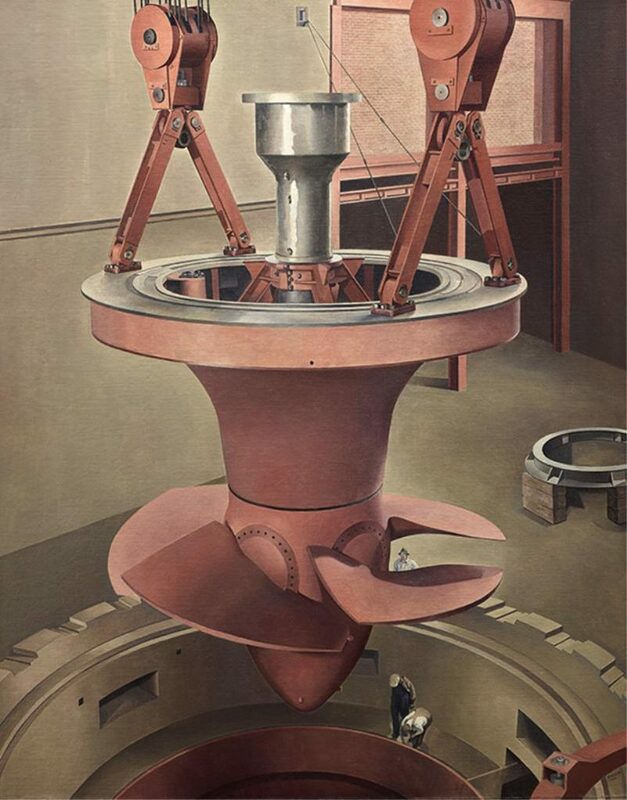 It created objects and installations, which transferred cosmic radiation, acoustic, and/or vibrating impulses into ever-changing, fascinating, yet puzzling images to allow spectators a glimpse into the worlds of alchemy, astrophysics and new technologies. 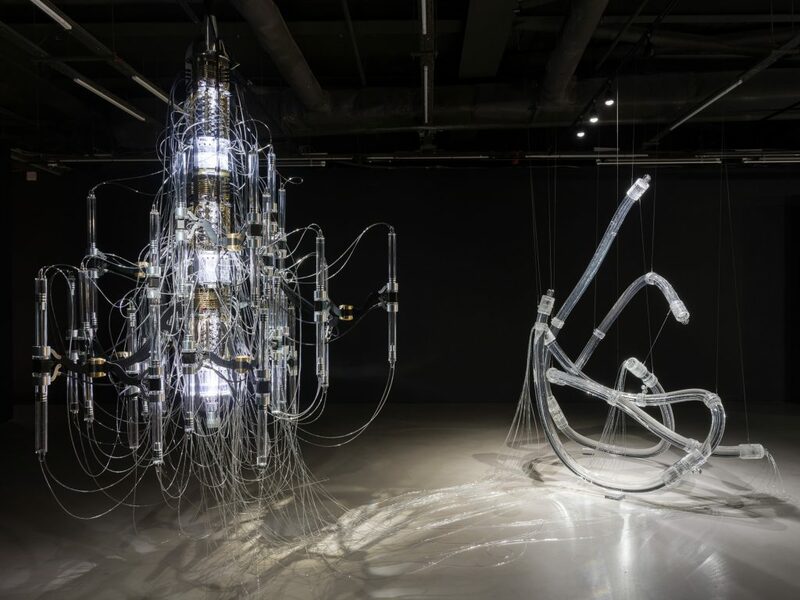 Suspended in the KCCUK gallery space, Cascade consisted of 18m-long, interconnecting transparent tubes containing fluid in constant circulation. Exploring the artistic potential of fluid dynamics (the science of liquids and gases in motion), the work investigated the possibility of controlling light propagation through suspended photonic crystals. 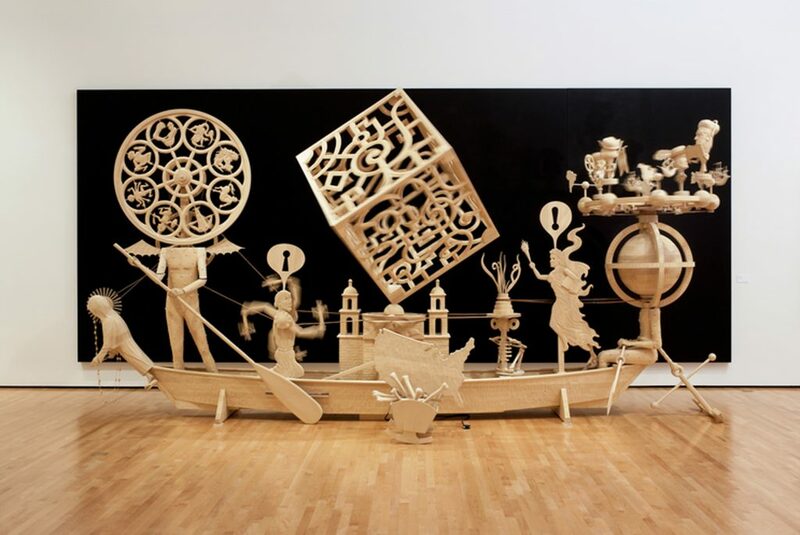 John Buck is perhaps best known for his carved wood and bronze sculptures and monumental woodblock prints. 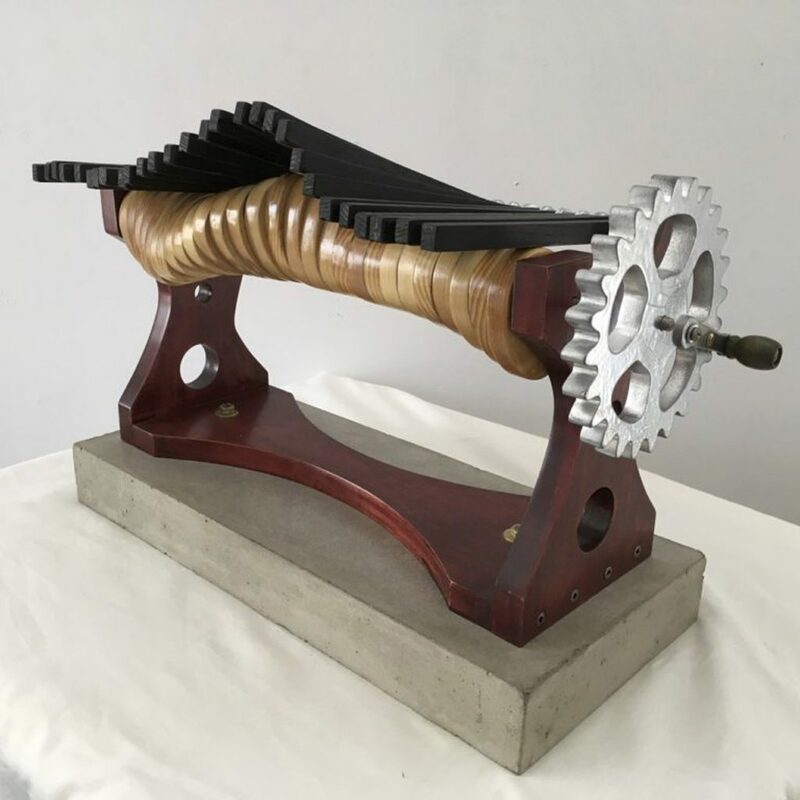 However, more recently he has turned his attention to creating complex, mechanical kinetic sculptures. Steven White incorporates salvaged materials and parts in his sound machines such as Superball Drum Machine is a kinetic sound sculpture that uses a drum made from an old propane tank, 50 superballs, a motor, gears and various other parts. The piece is set in motion via an unlikely set of variables to create an endless soundscape. It was installed in the granary at the Electric Eclectics Music Festival at the Funny Farm in Meaford, ON, Canada last year. 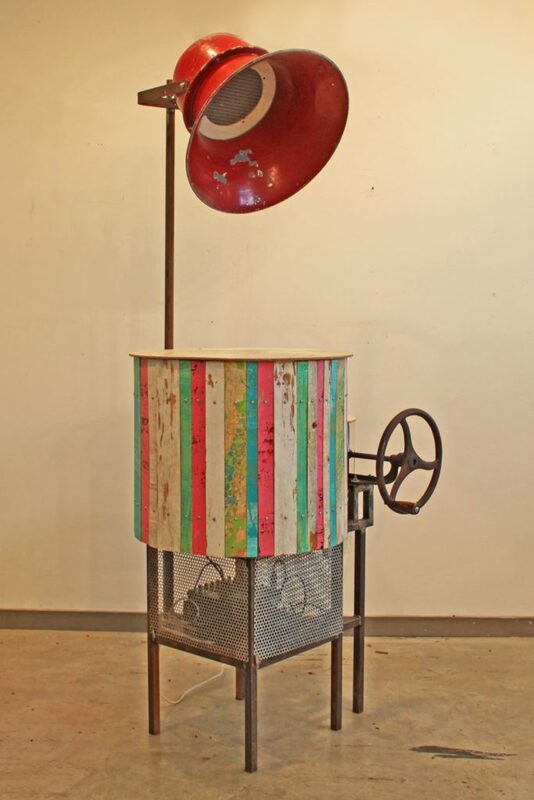 White’s Candy Machine uses an enclosed drum as the sound source that is then amplified and played back through a salvaged metal outdoor speaker. The viewer turns a wheel to activate percussive, acoustic sounds inside the enclosed drum, the contents of which remain a mystery. Candy Machine produces sounds that are familiar, yet sinister; it produces no candy, yet it has a saccharin quality to it.